Call of Duty: Black Ops II is a First-Person Shooter (FPS) that revolves around unique gamepaly that propels the Call of Duty franchise into a world of future warfare, and back again to the modern era. 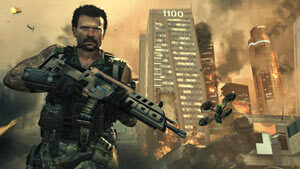 The game is a sequel to the 2010 release, Call of Duty: Black Ops, and features returning Black Ops characters Sgt. Frank Woods and Agent Alex Mason, joined by a wealth of new characters. Additional features include: two distinct yet linked playable time periods, advanced weaponry, branching storylines created by player choices in Strike Force missions, exciting multiplayer options, and more. Players of Call of Duty: Black Ops II gain an understanding of this and more through the game's additional timeline set in the late Cold War era of the 1980's. Within the campaign story, which spans these two eras, players will see familiar faces such as Alex Mason, his son David Mason, and Sgt. Frank Woods. Linking these together will be the rise of another player in the conflict, Raul Menendez.